The Stylist Den: Jumpsuit ... the dungaree A.D. 2010! Jumpsuit ... the dungaree A.D. 2010! Do you remember the dungarees that our mummies made us wear when we were babies? and those that we wore as rebellious teenagers with a pair of Doc. Martens? Well, fashion history is repeating, yet again, and dungarees have evolved into a more stylish piece of clothing:jumpsuits! Forget the denim and the baggy fit, from now on jumpsuit is going to be the new dungaree. The contemporary jumpsuit is a deluxe dungaree: different materials, not only denim, several colours, and the braces give way to a one-shoulder strap or a neck holder. The jumpsuit has a huge bonus: it becomes a proper evening outfit if you match it with high heels or platform shoes, shiny necklaces and bangles. 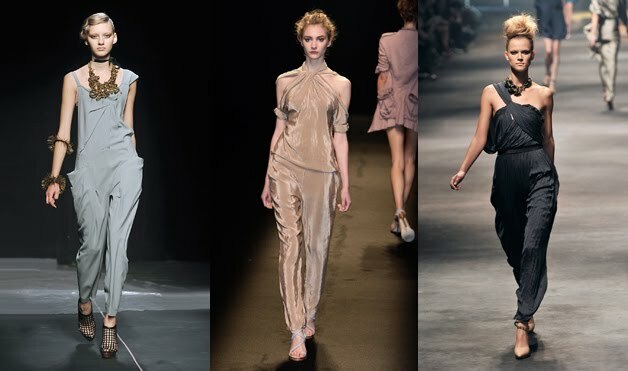 Here three examples of jumpsuit from street fashion retailers.